he extent to which Australia’s global success derives from its easy to- understand appeal – from mostly varietal labelling of wine names to the direct and overt fruitiness that still characterises many of the wines – can not be underestimated. Yet there are also fine wines with great depth and structure and others of real style, elegance and nuance. The first years of the new century have witnessed a sea change in placing much greater emphasis on diversity and regionality. The correlation between price and quality is also improving but care is needed when purchasing more expensive bottles. 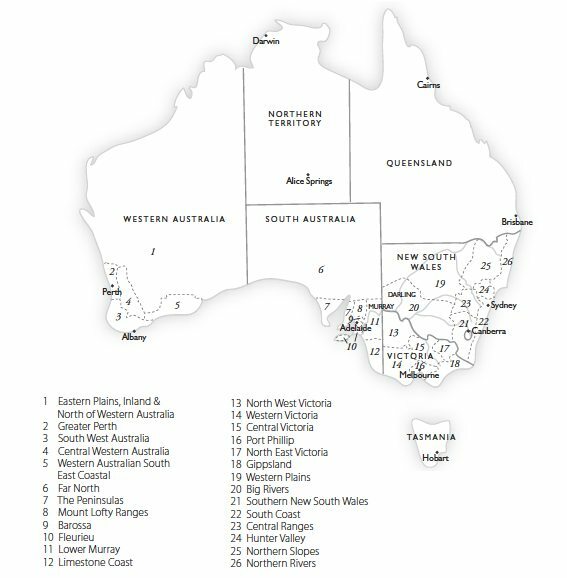 In order to give some coherence to Australia’s ever burgeoning vineyard area we have made four broad geopolitical divisions: South Australia, Victoria & Tasmania, New South Wales & Queensland, and Western Australia.